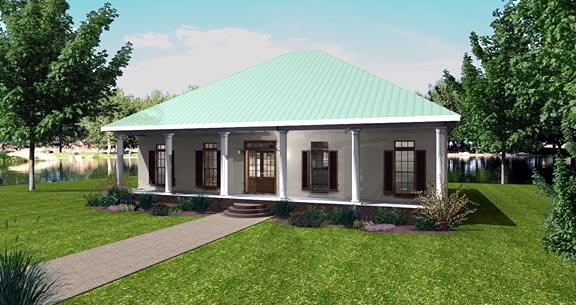 This plan has a lot to offer with its open floor design and relaxing porches. Enter into the nice sized Great Room through Double French Doors with an open floor plan that flows easily into the Kitchen & Dining Area. The Kitchen offers lots of cabinets for storage, a walk in Pantry and a raised snack bar. A cook top Island is the center of attention. The Dining Area is located at the rear of the home with sunny windows and has access to both rear porches. 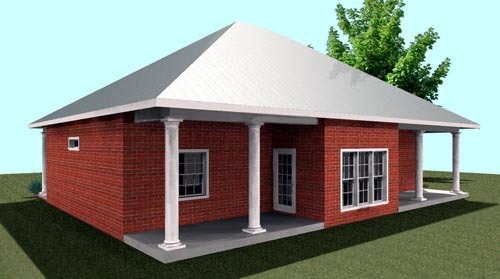 Split Bedroom plan, the Master Bedroom has a walk in closet and Master Bath with access to the Laundry. Bedrooms 2 and 3 are nice sized and share a bath.